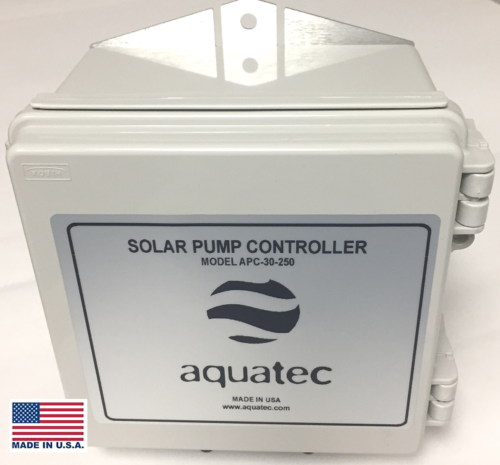 The Aquatec APC-30-250 Controller is designed specifically to interface between a solar photovoltaic array and the Aquatec SWP submersible pumps, such as the Aquatec SWP-4000 well pump. 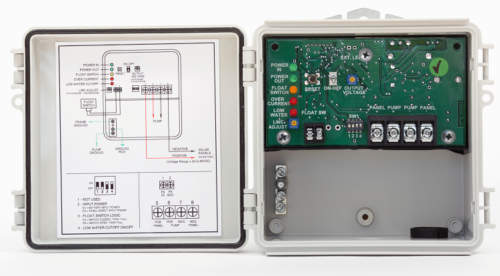 It is a solid-state power converter that optimizes and protects the solar well pump. The controller extends the power going to the pump with current boosting. This gives the pump more power to pump more water when the solar panel is cold and is producing a higher voltage than normal. Voltage is not used to produce power but accelerates the electron flow through a wire. Boosting the current equals more water. The Aquatec APC-30-250 controller has all the features of (and can replace) the Shurflo 902-200 and the Shurflo 902-100 controllers, and has the added capability of an extended operating range, since many systems are no longer 12V. Use the trimpot labelled “Output Voltage” to decrease (CCW) or increase (CW) the maximum output voltage as required. If the pump is drawing the well water level down too fast, the trimpot can be adjusted counter-clockwise to reduce the flow of the pump. Tank float switch: The pump controller can accommodate an optional tank float switch. The switch can be set to either perform for a normally closed or normally open function. Use dip switch 3 to select the applicable function. When set to the “ON” position a closed switch indicates a full tank. When set to the “off” position, an open switch indicates a full tank. 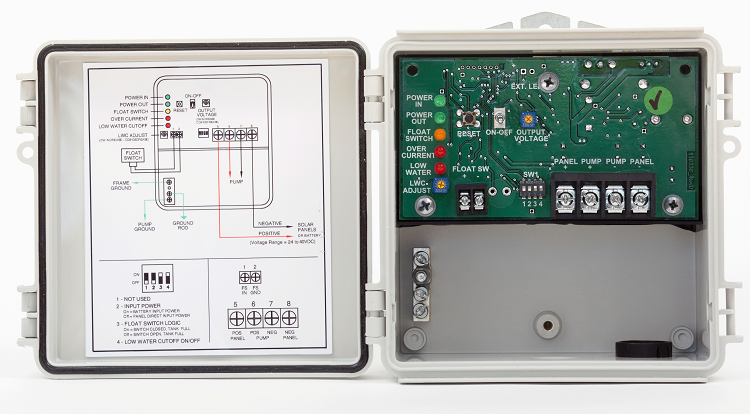 In the absence of a float switch, the dip switch should be in the “on” position or the pump will not run. Ask us for information & pricing on Repair Kits for the Aquatec SWP submersible pumps.